There are plenty of slot-based games out in the digital world today, but Wild Jane sets herself apart from the rest of the pack. Featuring a payline of 20 lines, there are plenty of chances to win. Not only that, but a bonus and multiplier feature gives the player every chance to hit it big. In addition to the actual slot aspect of the game, the aesthetics are pretty great, too. Set on the deck of a pirate ship, you feel as if you’re out on the seven seas with Jane herself. The only difference is you don’t have to worry about being attacked by other pirates and being thrown overboard. Easy has a fantastic range of promotional offers and bonuses that you could potentially trigger by playing Wild Jane! Leander Games, the developer of Wild Jane, has a vast array of slot-based games in their repertoire. Offering titles like Three Blind Mice, Codex and Mr. Billionaire, Leander takes what it does best – the slot-based game – and puts its own aesthetic spin on each. While they aren’t exactly reinventing the wheel with any of their releases, Leander produces fun slot games across the board that offers niches for any audience. Visit the site's all games page to learn of more slots developed by Leander Games. About the Game Wild Jane is taking you on the high seas aboard her ship with her all-female crew in a classic pirate ship setting. But her friends aren’t there just for show; Beth, Eli and May all offer their own unique bonuses and multipliers. That gives the player – who already has 20 playlines to work with – even more, chances to not only win and win big, but to earn free spins and unique multipliers. Earning free spins can be a huge boon with added multipliers from 4 to 6 times. The Treasure free bonus spins feature is particularly well thought-out, allowing you to trigger a round of free bonus spins. The Shoot the Tankard Pick Me Bonus also offers big rewards if you hit on specific lines. Like any digital game, though, there are caveats: in the bonus rounds, you have to avoid bombs that will derail you from collecting your free spins. Just because it’s a bonus round doesn’t always mean you get all the free stuff. 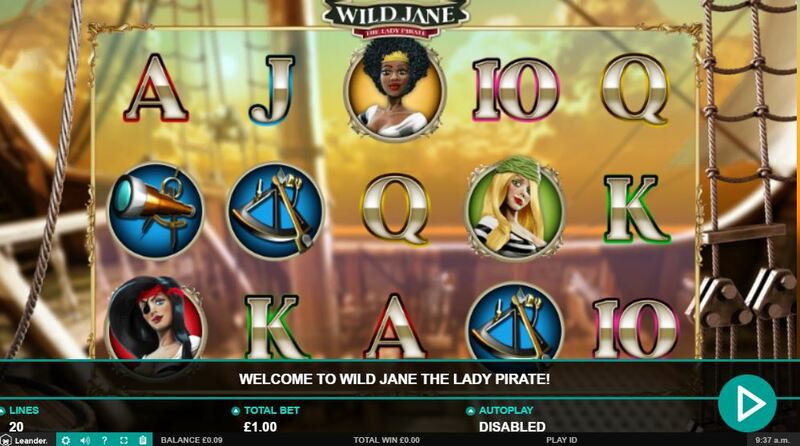 Additionally, Wild Jane allows you to play with free money or risk some of your own; up to €80 per spin. With all of the bonuses – including Jane herself, who can turn the whole reel into wilds – there are more than enough features to make this feel like more than your average slot game. Wild Jane delivers all across the board; it features a fun aesthetic in terms of a pirate ship led by a female pirate and her crew of sassy ladies but doesn’t feel like any cheesy cartoon slot game you’ve played in the past.